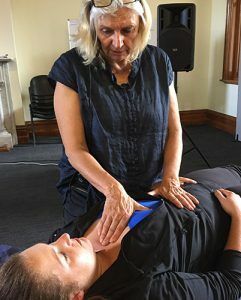 This program teaches you over 5 weekly sessions how to correct poor breathing habits and how to use breathing in combination with mindfulness and relaxation to manage symptoms, behaviour and stress. Stress, muscle dysfunction and many types of chronic illness can cause breathing to become dysfunctional. If your breathing becomes dysfunctional your health suffers. Training yourself to breathe correctly or functionally can be a missing link for improving your health and managing conditions such as asthma, sleep apnea, stress and anxiety, pain and chronic illness. breathing, relaxation and mind-body practices to use during formal practice, at rest and during daily life to improve health. We look at your health history to evaluate symptoms and causes of breathing issues. 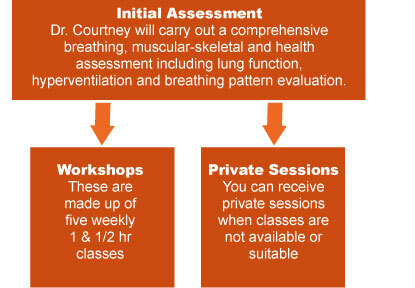 A comprehensive breathing assessment is carried out, including lung function, hyperventilation and breathing pattern evaluation. We record baseline measures so that your progress can be monitored. Dr Courtney can then advise if this program is likely to be helpful and/or refer for other treatment or to other health professionals if necessary. After the 5 sessions it is recommended that you are re-assessed to evaluate progress and advised if any other treatment is needed. Or please contact Dr Courtney if you would like to discuss how this revolutionary program could help you.